FORTALEZA, Brazil- Leaders of the BRICS group of emerging powers on Tuesday created a Shanghai-based development bank and a reserve fund seen as counterweights to Western-led financial institutions. The leaders of Brazil, Russia, India, China and South Africa agreed to launch the institutions to finance infrastructure projects and head off future economic crises. “These initiatives show that, despite our diversity, our countries are committed to a solid and productive association,” Brazilian President Dilma Rousseff said at a summit in the northeastern seaside city of Fortaleza. BRICS leaders have pressed for reform of the International Monetary Fund to give developing countries more voting rights. “The IMF urgently needs to review its distribution of voting power in order to reflect the unquestionable weight of emerging countries,” Rousseff said. The development bank will have initial capital of $50 billion that could rise to $100 billion, funded equally by each nation. To ease worries of any nation getting more power than the other, BRICS leaders agreed to put the bank’s headquarters in Shanghai. The first president will be Indian while the first board chair will hail from Brazil. An Africa Regional Centre will be based in South Africa. The bank will help emerging and developing nations mobilize resources for infrastructure and sustainable development projects, the summit declaration said. The Contingent Reserve Arrangement will have $100 billion at its disposal to head off potential economic volatility linked to the United States exiting its stimulus policy. China is expected to make the biggest contribution, $41 billion, followed by $18 billion each from Brazil, India and Russia and $5 billion from South Africa. The summit comes as the economies of some BRICS countries, which together represent 40 per cent of the world population and a fifth of the global economy, are cooling down, with Russia and Brazil expecting just one per cent growth this year. Experts say the new bank and fund will give the group the backbone of a formal organization. The talks in Fortaleza will open a series of marathon summits and bilateral meetings in Brazil. For Putin, who visited Argentina and Cuba before coming to Brazil, the trip gives him a chance to hammer home his calls for a “multipolar” world amid tensions with the West over the Ukraine crisis. The meetings give Putin his first international summit since being kicked out of the G8 group of industrialized nations over the Ukraine crisis. The United States is threatening to impose new economic sanctions on Russia over accusations that it is backing pro-Moscow separatist rebels in eastern Ukraine. After Wednesday’s BRICS-South America summit, Xi will launch the China-Latin America forum on Thursday, highlighting Beijing’s growing interests in a region perceived as the backyard of the United States. BRICS group of emerging powers launched a $50 billion development bank on Tuesday. The sixth summit of the BRICS group of large emerging economies in Fortaleza, Brazil, is a curtain-raiser to a brave new world where leading developing countries finally challenge the iniquitous international system. Since the 1970s, poorer nations have articulated visions of a New International Economic Order (NIEO) entailing non-exploitative interactions between the Global North and the Global South. But it is only now, with the BRICS (Brazil, Russia, India, China and South Africa) all set to launch ambitious new economic institutions, that we are walking the talk. Among the host of agenda items on the menu at Fortaleza, the most anticipated is the launch of the New Development Bank (NDB), a fresh multilateral lending organization dedicated to financing infrastructure and sustainable growth inside BRICS countries and beyond. With an initial seed capital of $50 billion derived from equal contributions of $10 billion from each BRICS member, this bank could scale up to a total lending chest of $100 billion. For context, the Western-dominated World Bank has a capital of $223 billion. By keeping open the prospect of other UN members making contributions to the capital base of the NDB, BRICS nations have laid the platform for eventually overtaking the World Bank and becoming the world’s largest multilateral donor. The inclusive character of the NDB permits it to tap into the fortunes of other rising stars within the Global South. BRICS is only one cluster in a larger universe of emerging economies with fast growth and investible surpluses. Columbia University’s Emerging Market Global Players list has a total of 16 countries, i.e. 11 other ascending players apart from BRICS. The NDB could invite these 11 to also become shareholders. The idea of ‘BRICS plus’ (i.e. BRICS and other emerging economies) could be nested in a formal institution to strengthen a united front of developing countries disappointed with the American-led Bretton Woods international financial institutions. One key prerequisite for the Shanghai-headquartered NDB is a coherent philosophy and character to set it apart from the World Bank and its sister concerns. The latter promote lending with a neoliberal view of advancing private market forces and downsizing the role of the state in developing countries. On the other hand, BRICS members are united on the question of protecting state sovereignty and ensuring that governments retain a lead in directing the economic strategies of their respective societies. NDB must in word and deed oppose neoliberal ideology so that it does not turn into a quantitative addition to the World Bank’s lending power. It must strive to be a qualitatively different animal that reflects the struggles and aspirations of the Global South to break out of Western hegemony. With China’s foreign aid budget alone exceeding that of the World Bank, the ‘numero uno’ position of the Bretton Woods institutions is already, in a sense, passé. But discomfort in Africa and Latin America about China’s predominance as a megalithic donor has increased of late. From the wary lenses of least developed countries, NDB can be a safe alternative to unilateral Chinese loans that come with strings attached like captive energy deals. The world’s poor would prefer borrowing from the NDB which reflects multiple interests than from a single source that lengthens China’s shadows on their societies. The Fortaleza BRICS summit will unveil a currency reserve pool agreement worth $100 billion to help member countries absorb economic shocks. This contingency fund has been dubbed by Russian Finance Minister Anton Siluanov as a “mini-IMF” to act as a buffer against panicky runs on currencies such as the ones that occurred last year owing to a flight of US dollar-based investors. BRICS have learnt lessons the hard way that reliance on the US Federal Reserve is a crippling dependence that is akin to being held hostage by Washington’s economic priorities. The “mini-IMF” is thus actually a vehicle for deliverance from the IMF, which has been Washington’s financial instrument as the sole rescuer during macroeconomic crises. BRICS are now ushering in what could become an alternative helpline for countries that are fiscally in the red. Apart from the NDB and the currency swaps, which have been subjects of fine-tuning among BRICS countries for years, the Fortaleza summit will also be looked upon for guidance on the critical question of energy security. Russia has proposed a new BRICS Energy Association with a fuel reserve that can assure continuous supply of oil and gas at predictable prices. Energy cost volatility has been a central problem plaguing economic growth in oil and gas importing nations such as India, China and South Africa. If a rules-based accord is reached at the BRICS level on energy exporters, Russia and Brazil, aiding the energy importing member countries, it will go a long way towards shielding the two Asian giants from the turbulence of the global crude market and improve their strategic autonomy. The host nation of the latest summit, Brazil, has also proposed an innovative new statistical platform with the BRICS imprint that will provide an alternative to the mainstream methodology adopted by the Organization for Economic Cooperation and Development (OECD) to measure GDP, inflation, unemployment and other macroeconomic indices. This statistical innovation could enable BRICS to introduce nuances into the development paradigms that have been designed by the Washington Consensus institutions since World War II. 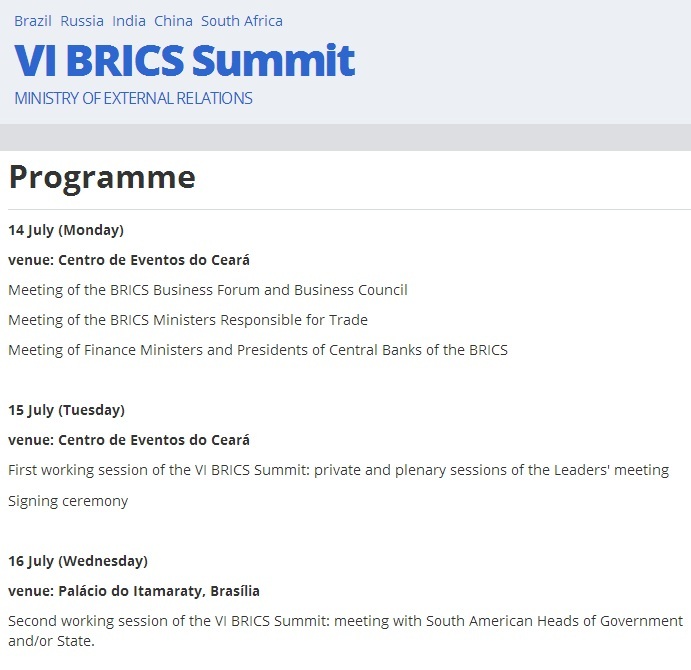 Brazil has also stressed that BRICS cannot be satisfied being a merely economics-centered institution. The Brazilian ambassador to India has mooted a “new architecture of international politics” alongside economic advancements as the twin goals of BRICS. In the past, BRICS have shied away from joint diplomatic or military action to overcome regional armed conflicts and tensions. At Fortaleza, the world will be watching if BRICS can formulate a mechanism that can go beyond their routine statements or communiqués which condemn violence or intrusion into sovereign nations’ internal affairs by interventionist Western powers. As leaders of their respective regions or sub-regions, BRICS countries could anoint local point persons for Africa, Latin America and Asia and offer undiluted support to these designated countries to douse wars, rebellions and other calamities befalling their neighborhoods. For instance, if a situation like the Islamist threat to Mali arises again, South Africa or Nigeria should be the point person backed unequivocally by all BRICS countries to be the decisive factor that paves the way to a solution. With ingenuity, BRICS can forestall the culture of neocolonial interference by the US and European powers in the guise of firefighting in the Global South. Imagine what a sea change we could witness in international security is there were, say, a BRICS Peacekeeping Force that would work along with the UN and regional organizations as an independent troubleshooting entity which could deploy in select unstable parts of the world. How refreshing would it be if there were BRICS diplomatic missions, consisting of high level representatives of the five nations, to go on fact-finding assignments, avert catastrophic wars or invasions, and even broker peace between warring parties? Hiding behind resource constraints and leaving the field to the Americans and the Europeans as the sole peace brokers and ‘conflict managers’ is not a respectable option for BRICS if it fancies itself as a motor for global leadership. Surrendering to the West or riding piggyback on Western global governance structures is a “status quo-ist” strategy that does not behoove of the revisionist BRICS. The Fortaleza summit can be a hopeful landmark for the downtrodden across the world if it lays the foundation for elevating the economic powerhouse of BRICS into a political tour de force. 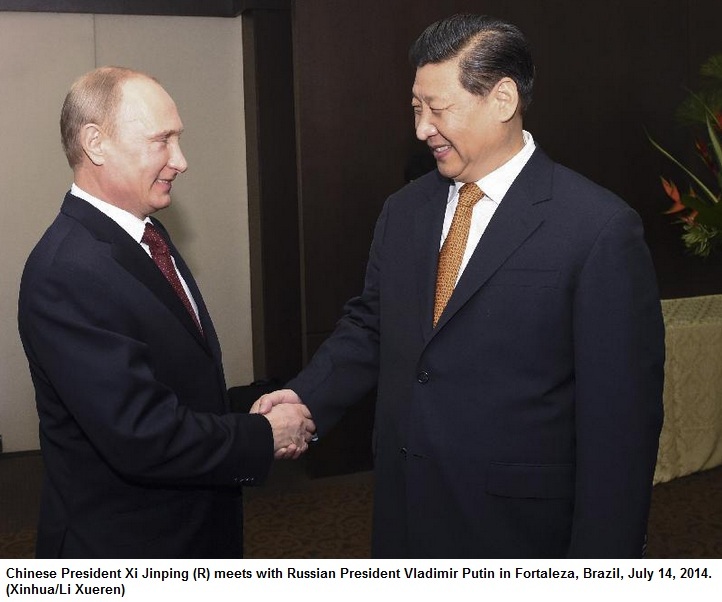 FORTALEZA, Brazil– Chinese President Xi Jinping said here Monday that China is “true in word and resolute in deed” on the China-Russia cooperation, calling on the two sides to implement their consensus “without any reservation”. Xi made the remarks at a meeting with Russian President Vladimir Putin ahead of their joint attendance at a summit of BRICS countries, which will be held in Brazil from Tuesday to Wednesday. Xi noted that two months ago, he and Putin reached a series of consensus during Putin’s China trip on enhancing bilateral ties and expanding cooperation, and jointly lifted their comprehensive and strategic partnership of coordination to a new height. To ensure the implementation of these cooperation projects, relevant departments and enterprises of the two countries have maintained close contact and negotiations in the past two months, said Xi. As for the future development, China and Russia should continue to intensify political support to each other, improve the depth and scope of cooperation and exert more efforts on the joint research, application and manufacturing in large strategic projects, said Xi. The two sides should also take more pragmatic and joint actions in military and security fields, he said. Xi urged the two countries to take more joint actions in international affairs, jointly promote cooperation among BRICS countries, increase their saying and influence, improve global governance, push forward democratization in international relations and promote world peace and development. For his part, Putin said that the Russia-China comprehensive strategic partnership of coordination is currently enjoying sound momentum, adding that he and Xi are personally caring and pushing forward the bilateral cooperation. Russia and China reached a series of important and concrete agreements during his state visit to China, he recalled. He said Russia is willing to make joint efforts with China to implement those agreements in an all-round and timely manner, chart the course of future cooperation, expand trade and investment scale and pay more attention to cooperation in energy, science and technology, among others. He urged an early start of the negotiation on Russia-China west line gas supply project, calling on the two countries to jointly safeguard cyber security and enhance coordination under the framework of the Shanghai Cooperation Organization and the G20. Putin said he will continue to maintain frequent contact with Xi and is looking forward to attending the informal economic leaders’ meeting of the Asia-Pacific Economic Cooperation, which will be held in China in November. The acronym “BRICs” was initially formulated in 2001 by economist Jim O’Neill, of Goldman Sachs, in a report on growth prospects for the economies of Brazil, Russia, India and China – which together represented a significant share of the world’s production and population. In 2006, the four countries initiated a regular informal diplomatic coordination, with annual meetings of Foreign Ministers at the margins of the General Debate of the UN General Assembly (UNGA). This successful interaction led to the decision that the dialogue was to be carried out at the level of Heads of State and Government in annual Summits. As of the First Summit, held in Yekaterinburg in 2009, the depth and scope of the dialogue among the Members of BRICs – which became BRICS in 2011 with the inclusion of South Africa – was further enhanced. More than an acronym that identified countries emerging in the international economic order, BRICS became a new and promising political-diplomatic entity, far beyond the original concept tailored for the financial markets.